Clin Cancer Res, 2017, 23(20):6239-6253. Temozolomide purchased from Selleck. Clin Cancer Res 2014 20(6), 1555-65. Temozolomide purchased from Selleck. Talazoparib and temozolomide exhibit marked combinatorial efficacy in PDXs. A, Western blot against MGMT by near-infrared imaging in PDX models. Clin Cancer Res, 2017, 23(2):523-535. Temozolomide purchased from Selleck. J Control Release, 2018, 269:245-257. Temozolomide purchased from Selleck. Viability of U87 cells(A) assessed by the Alamar blue assay, 72 h after transfection with siRNA anti-survivin (siSURV) or with siMUT and/or cell incubation with the chemotherapeutical drugs temozolomide (TMZ) and Bliss interaction index (B) determined for the combined effects on cell viability of survivin silencing plus treatment with each drug. Cells were transfected, for 4 h, with (14Ser)2N5/siRNA/HL complexes and, after an additional period of 20 h, cells were incubated with 400 μM TMZ(A) for 48 h. Results, representative of at least three independent experiments, are expressed as a percentage of the nontreated control cells. Combined treatment (dotted bar) was compared with the single drug treatment (gray bar) (**p < 0.01, ***p < 0.001) and the Bliss interaction index of each combined treatment was compared with the theoretical value expected for an additive effect (1.0) (#p < 0.05, ns, non-significant). Eur J Pharm Biopharm, 2016, 104:7-18.. Temozolomide purchased from Selleck. Cells were plated and 12 h after plating were treated with MMF (5 µM), FTY720 (50 nM), Temozolomide (TMZ, 3 µM) or in combination as indicated for 12 h. Cell viability was assessed by live / dead assay. 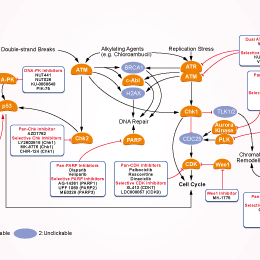 Cancer Biol Ther, 2014, 15(12):1646-57. Temozolomide purchased from Selleck. Neurochem Res, 2016, 41(12):3192-3205. Temozolomide purchased from Selleck. Catapano CV, et al. Cancer Res. 1987, 47(18), 4884-4889. Sun S, et al. J Neurooncol. 2012. Bauer M, et al. PLoS One. 2012, 7(6):e39956. Wong ST, et al. Anticancer Res. 2012, 32(7), 2835-2841. Lin CJ, et al. PLoS One. 2012, 7(6), e38706. Gori JL, et al. Cancer Gene Ther. 2012.